The Diamond Tri is an event that has something for everyone! Inspired by our One Mile Open Water Swim last yea with Challenge12, we are excited to challenge ourselves again and add a few more variables to the mix. Swim, bike, run or all three.....whether you'd like to do a Team or Individual triathlon there is something for you. There are even FOUR different individual tri lengths to choose from (Novice, SuperSprint, Sprint and Olympic)! The event is held at Eton Dorney (the 2012 Olympic Rowing venue) which I'm told is hands down the best Tri venue in the London area. So get a team together, get training and see you in September. As I mentioned, the three of us all did the One Mile Open Water Swim together last summer with Challenge12, and literally right after the swim we decided we have to get back in the water but up the ante this summer! We all started from hardly having swam at all (Lynn had never swam!) and all found that we loved it. 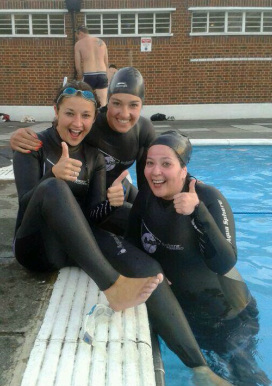 We had a great time training and can't wait to get back in our wetsuits. Well, the wetsuit part may be an overstatement :) Since we are all CHICAS, it was important to us to pick a charity that was women-focused, and Womankind Worldwide is exactly that. 1. We help courageous individuals to challenge violence and discriminationIn some countries, this could involve accompanying a girl to a village meeting so she can tell women and men that it is now against the law for a girl to be forced to marry a man after he has raped her, and encourage girls to see they do have a choice. 2. We help women come togetherIn many different ways, we help women join together, often for the first time, to talk about what they want to change, and then we help them achieve it. This could involve providing training in how to resolve conflicts, or in leadership skills, so women are better able to challenge violence and speak up for better healthcare or education. 3. We help women claim their rights and improve their livesWe might provide legal help to enable a woman to obtain a divorce from a man who beats her, or work with the police to encourage them to help women rather than return them to their husbands.